You don’t often see clever builds like this Technic Dot Matrix Display by AncientJames from New Zealand. As the reel starts rolling, the patterns on the cards inside correspond with the patterns on the display and can show anything that fits into a 5x5 square. 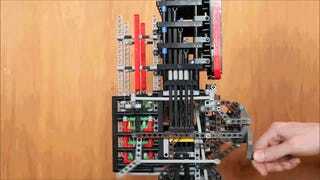 The creator’s video is titled, “Everything is awesome”. Well, this build certainly is! He posted the video on the EuroBricks Forums, where you can find a detailed description with images how this nice little LEGO gadget works.